There was a time when Florida was nothing more than untamed wilderness ruled by the proud Native peoples of the area, yet by the 1860s and 70s the region was steadily built up and settled by Europeans en masse. The Natives of the area would go on to be displaced, sent to reservations, or killed in fighting such as the Seminole Wars, and the pristine area witnessed a surge of settlers looking to make a life out of this new, uncharted land, along with numerous railroads and roads that penetrated and crisscrossed the wilds. People poured into the region at the time, and cities and towns began to pop up all over the place, transforming the landscape in the process. One of the first of these settlers was a businessman named Henry Sanford, who in 1877 bought up land just north of present day Orlando along the St. Johns River, for the purpose of creating a Catholic farming community called St. Joseph’s. It was more of a get-rich-quick scheme than anything religious as far as Hawkins was concerned, and he sat back waiting for suckers to come rolling in. Things would not go according to plan, and instead of the vast profits Sanford had imagined making on the land, he only ended up selling a few plots, and not long after the settlement experienced a devastating fire and an epidemic of Yellow Fever that swept out from the mosquito-choked swamps. The disease was catastrophic for St. Joseph’s, with quite a few who died simply buried out in the woods or on their property, and by 1887 the settlement was all but a ghost town. Sanford would go on to found the bustling nearby town of Sanford, Florida, and the area would later make a comeback at the turn of the century, while the site of St. Joseph’s would become absorbed by a township called Lake Monroe, but this dark history remained there to haunt it, perhaps literally. In 1905, a settler named Albert Hawkins bought up some land on which a family of Dutch immigrants had once lived before becoming victims of the Yellow Fever epidemic that had helped to wipe out the original St. Joseph’s colony. He figured out the grim secret buried on his rural land quite by accident, stumbling upon the weed infested unnamed graves as he explored the area one day, but he was respectful and decided not to have the bodies moved, rather maintaining the plot and their decrepit unmarked wooden crosses like a miniature cemetery, complete with a fence around it, and telling people to stay away from it. However, it would soon appear as though these mysterious graves held some sort of dark power that infused them. Neighbors sometimes complained to Hawkins that they could see mysterious lights roaming about at night in the vicinity of the graves, and that all manner of ghostly phenomena such as moving objects and strange noises had been plaguing their homes. On top of this were some ominous claims that the graves were actually cursed, seeking grim revenge on those who would try and defile them. In one instance, a neighbor allegedly got tired of the graves being there and tore down the fence surrounding them, yet later that same day this man’s house would supposedly be struck by lightning and razed to the ground. In another incident from the 1950s, a grandson of Hawkins himself was fooling around at the gravesite and kicked over one of the wooden crosses marking one of the graves. The very next day he would be killed in an auto accident involving a hit and run, with the perpetrator never caught. Even Hawkins himself purportedly had his own house catch fire after he tried replacing the time-worn, rotted old wooden grave markers with new ones, prompting him to take it as a warning to leave them as they were. All of this strange phenomena and death earned the area of that little cemetery the name “The Field of Death,” and locals became too terrified to go anywhere near it. Despite this, Florida’s popularity at the time, and the surging population and droves of tourists coming through, meant that more and more highways were being built in order to meet the demands of the rampant development going on. One of these was the proposed Interstate-4 (I-4), which was meant to connect Tampa and Daytona Beach, and which would cut right through the property on which those haunted graves rested. Hawkins had died in 1939, but he was survived by his widow, and there was not much that she could do at the time because she had sold the land it had become imminent domain. However, she did inform the state of the secluded little cemetery and suggested that they move the graves before construction began. The officials supposedly promised that they would have the bodies moved and interred at a proper cemetery, but this apparently never happened, and when construction commenced in 1960 the highway just ended up going up right over the graves and their forgotten remains. This would seem to have been a bad idea, because almost immediately there was tragedy that befell the project in the form of the catastrophic Hurricane Donna, which tore across the Florida at that exact time and even eerily changed directions to follow the path of the proposed I-4. Also odd was that meteorologists had predicted that Donna was going to just pass by relatively harmlessly off the coast, yet it suddenly made a sharp turn right towards the state for no apparent reason, and even more eerily still, passed right over the construction site. Whether this was all merely coincidence or not, it was one of the worst hurricanes the state has ever seen, and stalled construction on the highway for months. By far the most notorious of the many strange and quite frightening phenomena linked to this patch of road is the inordinately high concentration of traffic accidents that occur here. Depending on the source, there have been anywhere from 1,500 to over 2,000 traffic accidents in this one spot along a mere quarter mile stretch since the opening of the highway, with the Florida State Highway Department saying that there were 44 accidents over the course of 1995 and 1996 alone in this one place, and from 1999 to 2006 there were 440 accidents, many of them fatal. The rate of accidents at the Dead Zone of I-4 is so intense that many locals still absolutely refuse to drive over that area, instead going through great lengths to take roundabout routes around it. Officially this is explained away as the unfortunate result of so much traffic through the area, but even considering this the rate is quite high, and there are even the reports of people claiming that it often seems as if something has actually taken control of their vehicle. is there something more supernatural going on here, and if there is does it have anything to do with those graves? It is hard to say. Charley followed almost the same route as Donna. They referred to Charley as the ‘I-4 Hurricane.’ Strangely enough, there was construction going on around the graves. The land where the graves are was being disturbed again. It was almost like a repeat of Donna. Besides harrowing car crashed and deadly tornadoes and hurricanes, the I-4 Dead Zone has gathered about itself all manner of other assorted paranormal phenomena and high strangeness. One very frequently reported oddity is that radios, cell phones, and CBs go dead and refuse to work over the site, or that there will be picked up ghostly disembodied voices or anomalous static on the devices. Commonly reported are the sounds of children’s laughter, or of voices that desperately ask “Who’s there?” or “Why?”, yet never responding if one is to try and talk with the entities. Some people have even reported hearing not voices, but rather an ominous growling or snarling echoing out from their radios as they drive through. Considering that the immediate area has no radio or cell phone antennas, nor any microwave emitters, it is hard to tell what could be causing these disturbances. Is there a rational explanation, or something far odder at work here? Who knows? 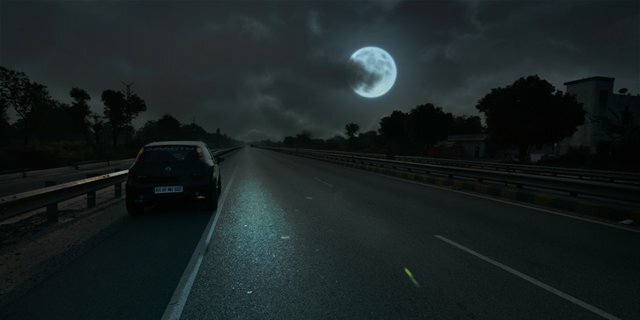 There are numerous other strange phenomena reported from the I-4 Dead Zone as well, including ghost lights, shadow people, roving cold spots, sudden thick fogs from nowhere, phantom hitchhikers, and ghostly vehicles. Add all of this to the death and tragedy that also seem to cling to it like flies to a corpse, and I-4 has gone on to be considered one of the strangest, most haunted places in the state. Is this just urban legend mixed with spooky history and superstition? Is it all overactive imaginations? Or could it be that this length of highway holds to it the specters of the dead, *bleep* to remain tethered here and compelled to lash out at those who have desecrated their graves? Thank you auntym.. I'm have a friend who lives near this place. I'm going to share this article with him. Very spooky..